The Israel Defense Forces (IDF) announced last week that it uncovered a new, covert Hizballah terrorist network operating in southern Syria with the backing of Iran. The announcement is an indication that the radical Shi'ite axis has not stopped in its efforts turn Syria into a base of operations. 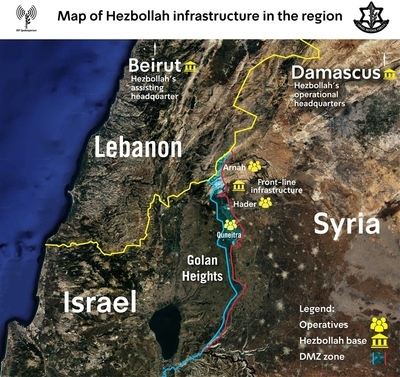 According to details released by the IDF, the first mission of the Hizballah network was to become familiar with the area of the Syrian Golan, near the Israeli border, and gather intelligence that would later be used in attacks. Operatives began gathering visual and communications intelligence from observation posts and military sites in south Syria, according to the IDF. This attempt by Hizballah to build a second war front against Israel, alongside the existing front in Lebanon, comes despite the organization's significant financial crisis. Hizballah chief Hassan Nasrallah called for donations this month acknowledging financial difficulties due to Western sanctions. The organization has been under U.S. sanctions for decades, but fresh sanctions passed in 2018 more aggressively target the organization's leadership, alongside companies and business figures that have been identified with its financial operations. According to the U.S. State Department, Iran gives its Lebanese proxy $700 million a year, but Iran is also facing its own biting American sanctions, putting Tehran's budget for Hizballah under strain. In previous years, Iran gave Hizballah approximately $1 billion per year. Nevertheless, Iran and Hizballah remain committed to investing resources into setting up an active terrorism network in southern Syria. Hizballah elements infiltrated southern Syria in 2013 as the civil war there raged. They operated under the command of senior terrorists – Samir Kuntar, who was convicted of murdering two Israeli policemen and three members of an Israeli family, and who was released by Israel in a prisoner exchange deal with Hizballah in 2008, and Jihad Mughniyeh, the son of the late Hizballah chief of operations, Imad Mughniyah. That network conducted rocket attacks, bombings, and mortar fire on Israeli targets. It was destroyed in strikes attributed in international media reports to Israel. Mughniyah was killed in 2015 along with several Hizballah and Iranian Republican Guards Corps (IRGC) officers as their convoy travelled in south Syria. They were in the area to scope out positions for missile fire on Israeli targets. Months later, Kuntar was killed in a blast in his building on the outskirts of Damascus. Now, as the Syrian civil war draws to a close, it appears Hizballah and Iran are trying to make a comeback, and to once again infiltrate southern Syria. "The leadership of the Shi'ite Axis has decided to attempt to re-establish a covert unit, with greater operational capabilities than its predecessors, which will be able to operate against Israel if ordered," the IDF said in a statement on Wednesday. The latest network began taking shape in the summer of 2018, the IDF said, and elements of the Syrian Armed Forces – dictator Bashar al-Assad's official military – are part of it, although without Assad's knowledge. "This network is composed of a chain of command and staff operatives from Hizballah and Syrian field operatives. The network is new and is currently focused on becoming familiarized with the Golan Heights area and is intended to eventually control teams of Syrian operatives who will launch attacks against Israel," the IDF said. 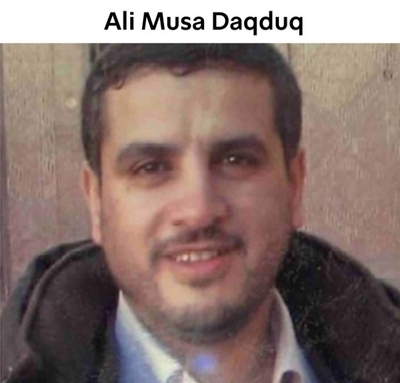 The network is run by senior Hizballah member Ali Musa Daqduq. He joined Hizballah in 1983, taking up a number of operational roles in southern Lebanon against Israeli forces. He traveled to Iraq in 2006, where he worked as head of operations in Hizballah's Iraqi branch. He led attacks on U.S. forces in the Karbala Governorate – attacks that included the abduction and execution of five American soldiers in 2007. Daqduq was then captured by U.S. forces and sent to an Iraqi prison. The Iraqi government, following demands by Hizballah's leadership, released Daqduq in 2012, and he returned to his native Lebanon. He entered Syria last summer to begin setting up the new Golan terrorism network. The activities in southern Syria saw members of the new network operate out of observation posts that belong to the Syrian Armed Forces. The IDF described this cluster of the network as Hizballah's "Southern Headquarters." Its operatives conduct border patrols, study the terrain, and analyze infiltration routes into Israel, while recording the IDF's routine activity. "A portion of the operatives underwent courses and training on behalf of Hizballah in sabotage, sharpshooting and firing Grad rockets. Some of them took part in or aided (2013-2015) actions against Israel including sabotage, rocket/mortar attacks and pre-mission intelligence gathering," the IDF said. A number of the operatives are local residents of the southern Syrian village of Hader, who the IDF assessed likely joined due to financial incentives. An additional component of the network is based on paramilitary organizations and armed members of political parties that are affiliated with the Assad regime. These include the armed wing of the Syrian Social Nationalist Party, which supports the ruling Ba'ath Party in Syria, and has armed militia members. The Arab Nationalist Guard allegedly provides the Golan terror network with cover in conducting observations of Israel. Groups in this budding terror network were compartmentalized and kept secret from one another, according to Israeli intelligence assessments, allowing the network's leadership to maintain independence from the Assad regime. That did not stop the IDF from identifying the network. Rather than strike its bases, the IDF initiated an "information operation," which serves as a warning that a failure to disband this network will likely result in future strikes. Maj.-Gen. (ret.) Amos Yadlin, a former Military Intelligence chief, placed the network within a wider Shi'ite axis threat, which includes precision missile factories in Lebanon, and cross-border attack tunnels stretching from Lebanon into Israel, both of which Israel exposed in recent months. "Back in 2015, [the] late Samir Kuntar and Jihad Mughniyya were already working on this terror network. It was destroyed after launching several attacks. Today we see an information operation against an embryonic terror network," Yadlin tweeted. The target audience, he said, included Hizballah, to inform it that it is vulnerable and to show where Hizballah invests its funds as Lebanon struggles with financial crises. A second target audience, he said, was Assad, whom Israel was telling to "take notice – your Hizballah allies are using your soil for [their] operations without your knowledge. The bills will come to you for payment." The discovery comes just as the international community is debating whether all of Hizballah should be classified as a terrorist entity and banned, former Israeli Defense Minister Moshe Ya'alon told Israel's Kann Bet radio on Wednesday. "Hence, I think this [exposure] maneuver was right," Ya'alon said. The United Kingdom banned Hizballah's political wing last month, classifying the entire organization as a terrorist entity that destabilizes the Middle East. Before that, the UK designated Hizballah's military wing, but treated its political arm as somehow independent. The new designation put an end to that artificial separation of Hizballah's various tentacles, which ran contrary to the reality of a single leadership controlling all of the organization's activities. The British law should see an end to the scenes of Hizballah's yellow flag being waved by supporters during rallies on the streets of London. Germany, on the other hand, has yet to follow suit, describing Hizballah as a "relevant factor" in Lebanese society, and noting that the European Union had banned the military wing in 2013. Germany's insistence on adhering to the false separation between the military and political wings continues to legitimize the Iranian proxy, even as it works to set up a terror base in Syria which could lead to a regional flare up. Meanwhile, Israel's Prime Minister Benjamin Netanyahu issued a warning to Iran and Hizballah: "We know what you are doing and we know where you are doing it. This is just the tip of the iceberg of what we know. Israel will not allow you to entrench yourself militarily in Syria. We will continue to act in overt and covert ways to thwart your plots." The coming weeks will reveal whether the Shi'ite axis heeds Israel's warning, or provokes action by continuing to work to turn Syria into a fortress of terrorism.